Google has undoubtedly improved on the Pixel 2 XL, with a phone that takes better pictures, has a better design, and has a better screen. From the camera and OS perspective, the Pixel 3 XL is hard to beat, and it's right up there as one of the best smartphones you can pick up in 2018. Did you notice that notch? For the third year in a row, Google has released its own-brand smartphone under the PIxel label, in a choice of two sizes, to try and put into physical form its vision of what a mobile phone should be – a direct, Google-ified, Android rival to the iPhone. But with Apple improving its handsets year on year, and the likes of Samsung, Huawei and others pushing out very good Android devices, can Google keep up? We've been putting the Google Pixel 3 XL under some rigorous testing over the past week to see how it stacks up against the competition. If you want the quick takeaway, then know this: the Pixel 3 XL is the best Pixel phone Google has put out, and undoubtedly one of the best phones of 2018, with some caveats. As always for a Pixel phone, it's the camera and the Google software that stands out, and you're going to have to get used to a rather chunky notch if you're going to fall in love with this particular phone. If you want some more detailed thoughts on the Google Pixel 3 XL, then read on. This is the larger of the 2018 Pixel phones, with a 6.3-inch display rather than a 5.5-inch one (all the other specs, besides battery size, are the same). It's yours in a choice of Just Black, Clearly White, and Not Pink (actually a very light pink), and if you buy direct from Google you'll spend £869 for the 64GB model and £969 for the 128GB model. Head over to Three and the 64GB Pixel 3 XL can be yours for £99 up front and then a monthly cost of £47 for 24 months – that's with 500MB of data month, 300 minutes of calls a month, and unlimited texts. More expensive plans are available if you think you'll need more data and more call minutes. Alternatively, buy direct: Carphone Warehouse will sell you the Pixel 3 XL SIM-free for £869 (64GB) or £969 (128GB), the same price as Google. Wherever you decide to buy the phone from, you can order it now, with shipping scheduled to start on the 12th of November. 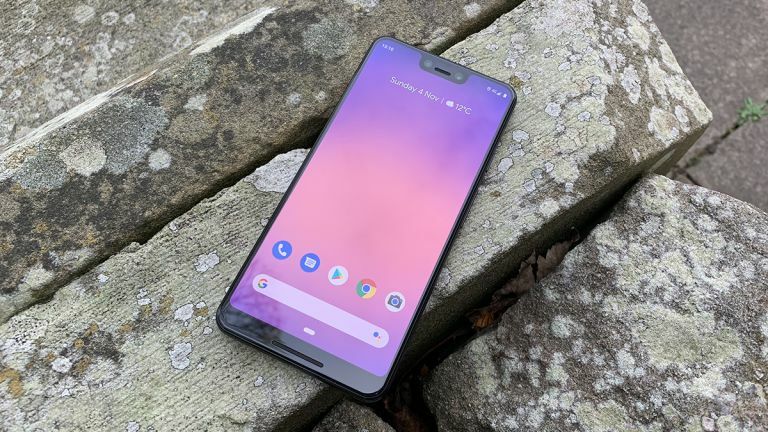 Google has tried to make the Pixel phones instantly recognisable, with their two-tone textured backings – as you'll know if you've spotted previous Pixels. That same design language is in evidence again here, though this time the backing is smoother. That's because the back is all glass this time around, in part to enable wireless charging, but Google's engineers have still managed to create a more matte-feel finish for the lower part of the back, so it won't slip right out of your fingers. We've also got the single-lens rear camera and the fingerprint sensor around the back – no in-screen fingerprint reader for the Pixel range yet. These Pixel phones have never really led the pack in terms of hardware design and the Pixel 3 XL is no different. As always, beauty is in the eye of the beholder, but we think this is a really, really fine-looking phone, with one caveat – that deep notch on the front display. It's deeper than most notches you'll see on 2018 smartphones, and it feels just a little clumsy. Status icons, the time, and other details can feel a bit lost in the big gaps the notch creates up at the top of the screen of the Pixel 3 XL. It's not exactly a dealbreaker, but we'd prefer something wider and shallower. Everything else about the build of the Pixel 3 XL is fantastic though, with curves and lines in all the right places, and a real feel of quality in the hand. It feels like a more expensive, better-built phone than the Pixel 2, which we've been using regularly up until now. The screen of the Pixel 3 XL stretches to 6.3 inches corner to corner with the help of that notch, though it doesn't feel as massive as that might suggest. If you have relatively big hands you can hold it comfortably, though typing really needs both hands. The bottom chin is slightly larger than the very top phones of 2018 as well. While it's clear Google is getting better at the hardware side of phone manufacture – and we do definitely like the design and feel of the Pixel 3 XL – it's still some way short of the likes of Samsung and Apple in precision engineering. You get a resolution of 1,440 x 2,960 pixels on the Pixel 3 XL (523 pixels-per-inch), which is just slightly less sharp than the Pixel 2 XL. We can report that the OLED panel looks fantastic no matter what it's been used for – gaming, web browsing, video watching, email checking, social networking... apps and images really pop. Did we mention that notch? It does look a little awkward in games that don't account for it, but most video apps (including Netflix) just stick black bars to the sides so you get a window with no cut-outs. Even in outdoor sunlight the screen holds up well and is easy to view. HDR content is supported too, which means video from HDR-enabled apps like Netflix is richer and offers more detail in the darker and lighter areas of the picture, and photos and videos you've captured on the Pixel 3 XL all look fantastic too. The Google Pixel 3 XL pairs the Snapdragon 845 we've seen in many a flagship Android phone this year with 4GB of RAM. That's just about the minimum you can expect from a top-end Android phone in 2018, but we didn't notice any slowdown or lag in use. 6GB would be nice, but the Pixel 3 XL seems to handle everything very well with 4GB. In GeekBench 4 (see the nearby box out), the Google Pixel 3 XL averaged 2,350 in the single-core test and 8,220 in the multi-core test. That's not as fast as the Huawei Mate 20 Pro or the Samsung Galaxy Note 9, which both got in the 9,000s for multi-core. Despite those slightly disappointing scores, we can confirm the Pixel 3 XL nips along very quickly. There's no lag or delay in any of the menus, and no problem with games or apps, no matter how demanding – even something like Asphalt 9 poses no problems. With Google being able to work on both the hardware and software together, it seems to have been able to squeeze out some extra performance from the Snapdragon 845 and just 4GB of RAM. Plus, we suspect the specs and power offered by the top-end Samsung and Huawei phones are really overkill for phone apps at the moment – better benchmark scores but no real difference day to day. That's not to say you definitely won't see slowdowns further down the line, of course. Our reviews can only take in the first few weeks of using a phone, so handsets with more power may stay lag-free for longer than the Pixel 3 XL. That said, the early signs are good, and you know this phone is going to get prompt software updates further down the line. Ever since the first Pixel, these phones have been known for their exceptional photo-taking capabilities, and the Google Pixel 3 XL certainly doesn't disappoint in this area. Like its predecessor, the Pixel 3 XL goes with a single-lens, 12.2MP rear camera, but Google has once again tweaked the optics and image processing for even better results. In short, you'd be hard pressed to find a phone that takes better pictures than this one – some of the results it gets really are breathtaking, especially in low light. As on the Pixel 2 phones, the Pixel 3 handsets combine several snaps taken in a burst to produce an end result, but over the last 12 months Google's software has got better at the job. That means more detail, brighter colours, and improved sharpness. It's not a huge jump from the Pixel 2 phones, but it is noticeable in a side-by-side comparison. Google has also added some very nifty tricks to the default camera app (some of which are rolling out to older Pixel phones too). You can take portrait photos with a background that's automatically smoothed and blurred (a so-called bokeh effect), for example, even though there's just a single lens. There's also a really neat feature called Top Shot, which captures images before and after you hit the shutter button, and lets you pick the best one of the bunch. This activates automatically and can really help in getting a perfect picture. As can the Group Selfie Cam feature, made possible by the dual-lens 8MP+8MP camera around the front: it can really make a difference when you're trying to fit a lot of people in the same shot. We're expecting good results from the AI-enhanced Night Sight mode too, but as yet this hasn't been pushed out. Photography is one area where the Google Pixel phones really do lead the pack, and if photos are important to you, this phone should be near the top of your list when you go shopping. The Pixel 3 XL, like previous Pixels, gives you three years of unlimited photo and video backups to Google Photos too. You can see some of the snaps we've taken with the Google Pixel 3 XL embedded in this article. The phone was even able to do a good job with a fireworks display, something that's notoriously difficult for a smartphone to capture. Here's another shot (below) from the same fireworks party. We can assure you there wasn't much light coming into this garden scene, just a few fairy lights and lights from the house behind the camera, but the Google Pixel 3 XL has done a tremendous job in illuminating it – and without the flash. Out in the daylight the Pixel 3 XL proves its worth again. If anything the colours can be a little too punchy, but most of the time you're going to come away with really impressive results. Look at the detail the phone picks out in the shadows on the bridge. Close-up shots are no problem for the Google Pixel 3 XL, with background bokeh blur applied as and when needed (the shot below was in normal Photo mode, not Portrait). Detail and colour reproduction is superbly handled again. The shot we've included below includes a lot of extremes when it comes to dark and light colours, but the Pixel 3 XL takes it all in its stride. It doesn't pick out every single detail from the trees in shadow, but it does do a commendable job, applying its HDR processing to make sure everything in the frame is well balanced. Something you do miss out on with just a single lens is optical zoom. Google offers a feature called Super Res Zoom instead – it uses slight variations in camera movement caused by hand shake to calculate where more pixels should be as you zoom in, but it's not as good as true optical zoom. We found the 3,430mAh battery in the Google Pixel 3 XL to be decent enough for a day's use but nothing beyond that. If you put your phone through a lot of calls, GPS use and gaming in a day, you're likely to be hunting for a charger by the evening. The phone does seem to keep its charge well in standby mode, so if your job means your Pixel 3 XL mostly sits in a drawer all day, you should have plenty of juice left for a full night out in the evening as well. If you're putting a lot of demands on the phone though, that battery level can sink quite quickly – it's that huge screen that does it. Of course you can dial down the brightness and reduce the screen resolution if you like, which does help. Even with the adaptive battery features of Android 9 Pie in play, we never felt fully confident about getting a full day's use out of the Pixel 3 XL. We always ended the day with some charge left during our week with the phone – sometimes as much as 20 percent – but we weren't on it non-stop. This seems to be an area where phone makers are struggling to make improvements. New this year is wireless charging for extra convenience, and if you fork out for the official Pixel-branded charging stand, you can use the Pixel 3 XL almost like a Google Home speaker: setting alarms, playing music and so on with your voice. And we can report the audio performance is actually better than average, both from the built-in, dual front-facing speakers and from the USB-C headphones you get in the box. Only the real audiophiles will need to upgrade to a better pair of headphones – for the rest of us, what you get in the box is going to do just fine. That's not to say the Pixel 3 XL can blare out the tunes as well as an Apple HomePod but it's perfectly fine and even quite impressive for podcasts, gaming and movie audio. Music played through the bundled headphones, meanwhile, sounds rich and balanced. Besides the camera, perhaps the next-best reason to buy the Pixel 3 XL rather than any other Android phone is the software. This is stock Android with a few Pixel bells and whistles on top, like the calendar widget that tells you when your next appointment is coming up, and the animated lock screen mode. Google has had more than 10 years to get Android right and it shows – this is a stable, mature operating system, and with Android 9 Pie Google has sensibly decided to adopt a gesture system similar to the one on the newer iPhones, with swipes replacing buttons. There's also all the new Digital Wellbeing features in Android 9 Pie, though these aren't exclusive to the Pixel 3 XL. We particularly like the "Flip to Shhh" feature – currently in beta – that lets you turn your phone over to activate Do Not Disturb mode (very handy for meetings and dinner times). As on the 2017 Pixels, you can squeeze the sides of the Google Pixel 3 XL to launch Google Assistant or another app – it works very well but it's not something we particular found ourselves using an awful lot. Speaking of Google Assistant, the Pixel phones can't be beaten in terms of Google Assistant integration. A long press on the Home button or a swipe from the Home screen and the Assistant feed is there for you, and you can of course launch the app with a "hey Google" voice command as well. As far as security goes, it's pretty much par for the course. There's a rear fingerprint scanner which should really be your primary way of locking and unlocking the Pixel 3 XL, but you can use a PIN, a pattern, or a face if you prefer. Google seems to have quietly removed the voice unlock option we've seen on Pixels past, however. It's also worth mentioning that the Google Pixel phones do of course get Android updates faster than any other handsets. When Android 10 and Android 11 roll around, the Pixel 3 XL is going to be one of the first phones in line. Come for the excellent camera, stay for the Pixel Android and speedy software updates. With an improved screen, improved software, and an improved camera (mostly on the software side), the Pixel 3 XL is undoubtedly the best phone that Google has ever put out. You're going to have to pay a lot for this handset, but we'd say it's just about worth it. That rather ugly notch aside, the Pixel 3 XL and the Pixel 3 are also better designed and better built phones than Google has managed up until now. While they don't quite have the fit and finish of the iPhones or the Galaxy phones, they're getting closer. There are really three main reasons to buy the Pixel 3 XL: the outstanding camera, the excellent Pixel-ised version of Android, and the larger screen (the reason why you might pick this over the Pixel 3). If those are important to you, put this near the top of your list when you're looking for your next smartphone. It's also worth weighing up some of the excellent work being done by other phone makers this year: think the Huawei Mate 20 Pro and the Samsung Galaxy S9 Plus, for instance. Android fans have a better choice of handsets than ever to pick from. When it comes to buying a phone, most people seem to pick between iOS and Android first. If you prefer the latter, and you want the best software and camera experience around, the Pixel 3 XL is difficult to overlook. It's a very close call between this and the Pixel 3, but that bigger screen is useful for movies and gaming, even if you do have to put up with that notch.